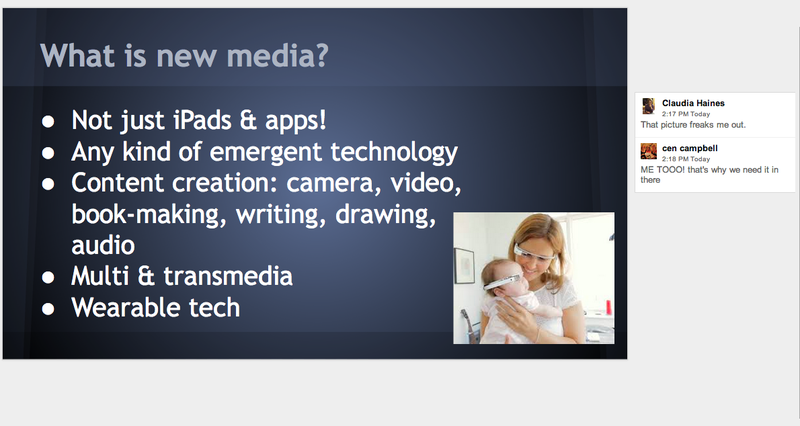 We’re working on a New Media Storytime presentation and I included a picture of a mom and infant wearing Google glass. See how Claudia Haines, my co-presentor, responded to the image? That got us thinking about some other kids & tech images that freak us out. We are NOT about technology for technology’s sake at LittleeLit.com, nor do we support the “earlier the better” philosophy for media consumption. This one (below) freaks me out because the kid isn’t old enough to get away if s/he wanted to. Boppy and an iPad?! Not in my house! And this one freaks me out for the same reason- the kid can’t get away! The key to using technology intelligently & appropriately with young children is the same as anything else to do with young children: support the development of human relationships. My colleague Suzanne Flint at the California State Library’s Early Learning with Families 2.0 initiative is insistent that the library world needs ages & stages recommendations for media use with young kids (0-5 is too huge of a developmental time span, let alone 0-8! ), and I agree. We have lots of work to do, colleagues! It’s those of us who are freaked out by this kind of image that need to be working on this issue. Posted on February 23, 2014, in Literacy. Bookmark the permalink. 2 Comments. Completely agree – we need to be able to match up our demonstrations and recommendations with really solid child development knowledge. And by really solid, I mean we need to know more than a bunch of developmental milestones like what you see in chart. We need to be able to think critically about contemporary early childhood, how families are doing, what families are doing and how and what we as children’s librarians can do to support them in our communities. AH! Freaks me out, too. And I used to get peeved when people lef tthe TV on for their under 2’s. Time to re-prioritize the pet peeve chart!